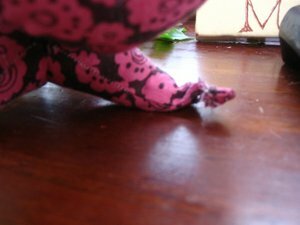 …like applying the chalkboard paint with a sponge applicator or roller to avoid the streak marks that brushes leave behind…and gluing scraps of vintage fabric, wallpaper, labels, to the backs of standard erasers for ‘retro appeal’. More button inspiration which I’m always looking for these days, of course! 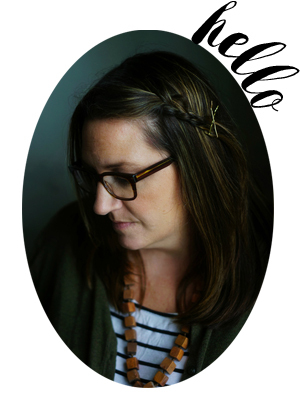 There’s also an inspiring article on some successful women entrepreneurs who have turned their bliss into business….inspiring! Hillary gave us a preview pattern of a pointy kitty from the booklet of patterns she’s working on…So I was very excited to make one with my stash, even though I didn’t have the best coordinating fabrics. I still wanted to give it a try. 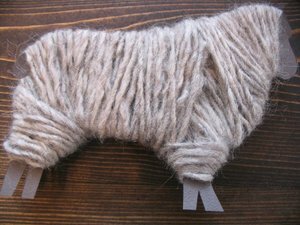 You would have thought that this kitty was filled with catnip because another kitty in my house has taken it upon himself to shred every ‘point’ on this little project. I’m not even sure sad bunny would be friends with this sad little kitty. Isn’t that issue of Country Living wonderful? I usually flip through a magazine once (not even reading the articles), then toss it aside, but I’ve looked through this one a few times. Poor pointy kitty! I’m sure my real-life kitty would do the same – he’s quite a rascal. It must have been ‘kitty making weekend’ because I finished two Denyse Schmidt kitties myself. Your sad kitty made me laugh! (Sad bunny says come on over here where it’s safe!) Poor guy, makes me remember why we haven’t yet gotten a new pet (although I love them). 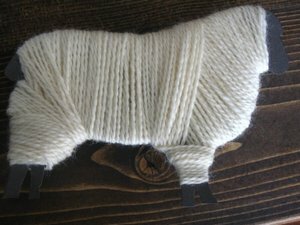 I love the sheep Molly! What a cool idea, I will love to see what you do with them. 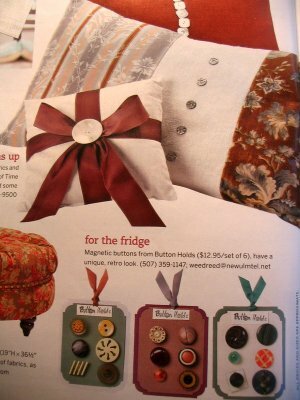 I really liked this issue of Country Living too! I enjoy reading about other women & there business.The sheep is darling and the kitty is cute too. Coutry Living is so inspirational and I’ve only just discovered it. I won tickets to the Country Living Spring Fair in March and needed to know what all the fuss was about. I love your sheep! Your happy kitty made me laugh! 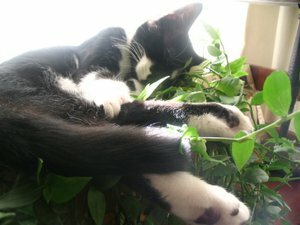 Is he sleeping on a potted plant? 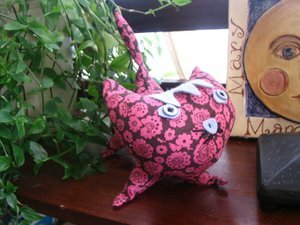 I think sad kitty is still cute, love the fabric! I haven’t read mine yet! 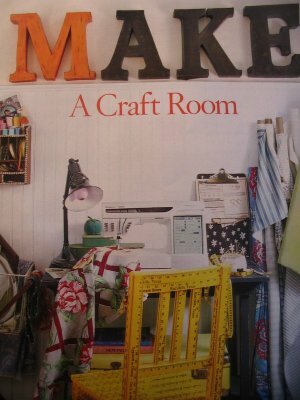 I’ll have to get to it:) I love that craft room! hi molly,i got your comment….i have been super busy lately. i sell my rings at a few places in the country..where do you live? soon they will be on my website- but it’s going to be a random sort of thing. say your size, colors you like and then i make you some for x amount….need to figure out the logistics still.let me know if you would like some or do a swap or something! Wow love that kitten! The – ahem – ‘dog-eared’ look is very endearing! We’re thinking of a chalkboard for our kitchen too. But that’s some way down the list of ‘things to do around the house’! The current issue of Country Living is the BEST!! I find myself thumbing through it over and over. I love the little kitty’s and the sheep. I like all the crafty stuff you do!! ahh! 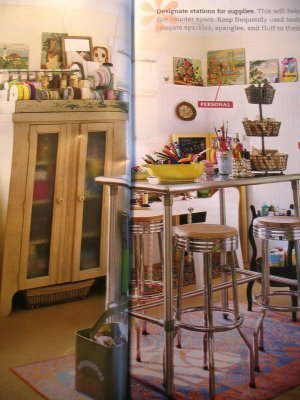 I was really JUST going to post that craft room from the Country Living mag-freaky! No kidding!!!!! 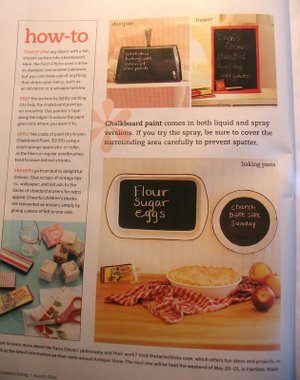 Are they enamel dishes painted with blackboard paint in the top picture?What a great idea! I have the same CL issue!! I was very inspired too. Oh, how I covet both the yardstick chair from CL, and your fabulous pointy kitty! Previous Previous post: What a Reward! Next Next post: Hip! Hip! Hippo! ?